Hamburg Airport (IATA: HAM, ICAO: EDDH), known in German as Flughafen Hamburg, is the international airport of Hamburg, the second-largest city in Germany. Since November 2016 the official name has become Hamburg Airport Helmut Schmidt, after the former German chancellor Helmut Schmidt. It is located 8.5 km (5.3 mi) north of the city center in the Fuhlsbüttel quarter and serves as a hub for Eurowings and focus cities for Condor, Ryanair, and TUI fly Deutschland. Hamburg Airport is the fifth-busiest of Germany's commercial airports measured by the number of passengers and counted 17,231,687 passengers and 156,388 aircraft movements in 2018. It is named after former senator of Hamburg and chancellor of Germany, Helmut Schmidt. As of July 2017, it featured flights to more than 130 mostly European metropolitan and leisure destinations as well as three are long-haul routes to Dubai, Tabriz and Tehran. The airport is equipped to handle wide-bodied aircraft including the Airbus A380. Hamburg's other airport, Finkenwerder, is not open to commercial traffic. The airport was opened in January 1911 from private funding by the Hamburger Luftschiffhallen GmbH (HLG), making it the oldest airport in the world that still in operation,´. The original site comprised 45 hectares and was primarily used for airship flights in its early days. In 1913, the site was expanded to 60 hectares, the northern part being used for airship operations, while the southeast area was used for fixed-wing aircraft. During the First World War, the airship hangar was used extensively by the German military, until it was destroyed by fire in 1916. During the British occupation, beginning in 1945, the airport was given its current name, Hamburg Airport. It was used extensively during the Berlin Airlift in 1948 as a staging area, as the northern air corridor went between Hamburg and West Berlin. When Lufthansa launched passenger operations in 1955, Hamburg was used as a hub until Frankfurt Airport took over due to growth constraints posed by the location in the city. Lufthansa Technik still maintains a large presence at the airport due to the early activities of the airline at the airport. In the 1960s discussions began with the aim of moving the airport to Heidmoor near Kaltenkirchen. Among the reasons cited were limited expansion possibilities, capacity constraints due to crossing runways, and noise. Lufthansa had introduced the Boeing 707 in 1960, which made more noise than previous piston engined aircraft. The plans were dropped due to bad experiences in other cities with airports being moved far from city centres and Lufthansa's move to Frankfurt. In the early 1990s, the airport began an extensive modernization process. The plan, called HAM21, included a new 500 m pier extension, a new terminal (Terminal 1), and the Airport Plaza between Terminals 1 and 2, which includes a consolidated security area. The airport's shareholders are the City of Hamburg and AviAlliance. The Radisson Blu Hotel Hamburg Airport was added in 2009, combined with new roadside access and a station and connection to the rapid transit system Hamburg S-Bahn. In January 2016, TUIfly announced it was leaving Hamburg Airport entirely due to increasing competition from low-cost carriers. While the summer seasonal routes would not resume, all remaining destinations were cancelled by March 2016. A few weeks later, it was officially announced that the airport was to be named after Helmut Schmidt, a former Senator of Hamburg and chancellor of West Germany. On 10 November 2016, the airport was renamed Hamburg Airport Helmut Schmidt. In October 2016, Air Berlin announced the closure of its maintenance facilities at the airport due to cost cutting and restructuring measures. In June 2017, easyjet announced it would close its base at Hamburg by March 2018 as part of a refocus on other base airports. While over half of the former services were cut, several routes remained in place as they are served from other easyJet bases. In October 2018, United Airlines announced the end of its seasonal service to Newark, leaving the airport with only three long-haul routes, all to the Middle East and no direct services to North America. Hamburg Airport originally covered 440,000 m2 (4,700,000 sq ft). Since then, the site has grown more than tenfold to 5.7 km2 (2.2 sq mi). The main apron covers 320,000 m2 (3,400,000 sq ft) and features 54 parking positions, the passenger terminals provide 17 jetways. As of July 2016 the airport only has three routes served with Wide-body aircraft, however during 2016 three gates were upgraded with double-Jet bridges to provide faster boarding and de-boarding for large planes like Airbus A380. The runways, taxiways and aprons can accommodate large aircraft, including the Airbus A380. Emirates plans to replace one Boeing 777 with A380 aircraft on the route. On 28 May 2018, Emirates announced it would commence services from Dubai International Airport to Hamburg with the A380. Hamburg has two terminals, Terminal 1 and Terminal 2, connected by the Airport Plaza and the baggage claim area that extends through the lower levels of all three buildings. These three buildings were designed by Gerkan, Marg and Partners. Both terminals have a high, curved ceiling designed to emulate the shape of a wing. In all buildings level 1 is the departure level, while level 0 is arrivals. Hamburg Airport offers 12 baggage claim belts on the arrivals level. The Airport Plaza hosts the central security check as well as shops, restaurants, lounges and other service facilities. It houses the S-Bahn station (suburban railway) and was completed in December 2008. Terminal 1 was completed in 2005 and is highly similar to Terminal 2 in terms of design and size. It has numerous energy and water saving features like rain water collection for use in restrooms and a ThermoLabyrinth, which uses ground temperature to help regulate the building's temperature and reduce loads on the air conditioning systems. Terminal 1 houses most of the airlines including those from the Oneworld and SkyTeam alliances. Terminal 2 (despite its name, the older facility) was completed in 1993. It houses Eurowings and Lufthansa with its Star Alliance partners, amongst others. 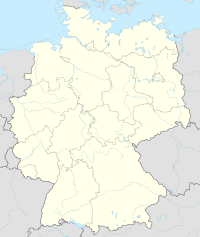 The airport is around 8 km (5.0 mi) north of Hamburg city centre and 8 km (5.0 mi) south of Norderstedt in the borough of Fuhlsbüttel. S-Bahn service S1, operated by Deutsche Bahn operates every ten minutes between the airport, Ohlsdorf, Wandsbek, Hamburg central station, Altona, Blankenese and Wedel. It is part of the HVV fare organisation offering tickets for all modes of public transportation in Hamburg. Going towards the airport, S1 trains split at Ohlsdorf station, with one portion going to the airport and the other going to Poppenbüttel. By road, the airport can be reached from motorway A7 using the state highway B433, which is the third ring road. Motorists from the east of the city must drive through Hamburg. The airport is also linked by some local bus routes to nearby areas as well as regular coach services to the cities of Kiel and Neumünster. Hamburg Airport is the inspiration for the world's largest miniature airport, named Knuffingen Airport, part of Miniatur Wunderland. ^ Flughafen Hamburg. "Passenger statistics and aircraft movements". Ham-airport.de. ^ a b c d e f g "Our history". Retrieved 20 July 2018. ^ "Emirates announces start of scheduled A380 service into Hamburg". ^ "Flughafen Hamburg - Destinations & airlines". Retrieved 4 June 2015. ^ "Air Malta kommt nach Hamburg und Leipzig". ^ a b c d e "Flughafen Hamburg - News and Events". Haminfo-terminal.com. Retrieved 23 July 2018. ^ "Corendon Airlines Hub Izmir". corendonairlines.com. Retrieved 14 December 2018. ^ a b c Liu, Jim. "Eurowings files additional short-haul routes in S19". Routesonline. Retrieved 13 March 2019. ^ "Flughafen Hamburg - 404 - Inhalt nicht gefunden" (PDF). www.hamburg-airport.de. ^ "Neue Routen ab Herbst: Dreimal Deutschland mit Hop!". ^ "Flughafen Hamburg - Qeshm Airlines startet neue Strecke von Hamburg nach Tabriz". www.hamburg-airport.de. ^ "Flughafen Hamburg und Qeshm Air profitieren von Iran-Öffnung". 15 July 2017. ^ "SAS verbindet Hamburg mit Bergen". ^ 2018, UBM (UK) Ltd. "SunExpress Germany S19 network additions as of 18OCT18". routesonline.com. ^ "Tunisair bietet Monastir-Routen wieder an". ^ "Flughafen Hamburg - Widerøe verbindet Hamburg neu mit Bergen". www.hamburg-airport.de. ^ Flughafenverband ADV. "Flughafenverband ADV – Unsere Flughäfen: Regionale Stärke, Globaler Anschluss". Retrieved 4 June 2015. ^ "Flughafen Hamburg - 404 - Inhalt nicht gefunden". Retrieved 4 June 2015. ^ "world's largest miniature airport opens". USA Today. 16 July 2011. Retrieved 17 July 2011.